With the popularity of vintage and classic caravanning rising exponentially, it was only natural that we should also see a rise in the vintage and classic tow car. Both are often creative works of road going art and coupled together paint a stunning combination. They are attention grabbers, often stopping people in their tracks. Pull into a rest stop or motor camp and the rigs will pull people in like a magnet. Such is the appeal to the public. 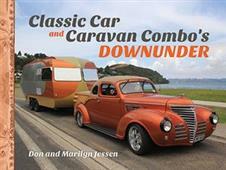 Don and Marilyn Jessen profile a selection of the prettiest classic car and caravan combos across Australia and New Zealand, including restoration, retro builds and acquisition stories, talking to the owners about their twin passions and the journey they have taken to owning their car and caravan combo. For many readers it will be a nostalgic trip down memory lane, and for others it will bring on the excitement of owning a classic car and caravan combo.